EN 60679-1 ed. 3 Piezoelectric, dielectric and electrostatic oscillators of assessed quality - Part 1: Generic specification - IEC 60679-1:2017(E) specifies general requirements for piezoelectric, dielectric and electrostatic oscillators, including Dielectric Resonator Oscillators (DRO) and oscillators using FBAR (hereinafter referred to as "Oscillator"), of assessed quality using either capability approval or qualification approval procedures. NOTE Dielectric Resonator Oscillators (DRO) and oscillators using FBAR are under consideration. 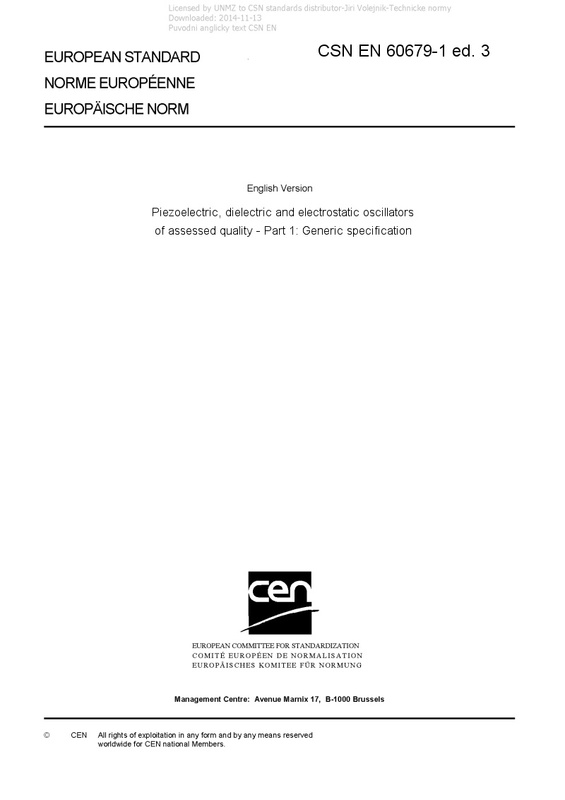 This edition includes the following significant technical changes with respect to the previous edition: a) the title has been changed; b) additional matters related to oscillator using SAW or MEMS resonator in "Terms, definitions and general information" have been included; c) measurement methods of IEC 60679-1:2007 have been removed (they will be moved to IEC 62884 series); d) the content of Annex A has been extended; e) a new term and definition DIXO (Digital interfaced Crystal Oscillator) has been added; f) a new term and definition SSXO (Spread Spectrum Crystal Oscillator) has been added; g) Annex D has been added.